In one tradition Auahi-roa (a comet) married Mahuika – goddess of fire and the grandmother of Māui. The main body of Māori mythology is contained in three story complexes. Digitised copy of Elsdon Best’s work Māori Religion and Mythology. Māori myths and legends expressed in clay by Lower Hutt sculptor Frances Wood. Newspaper article about the legend of Tinirau and Kae. 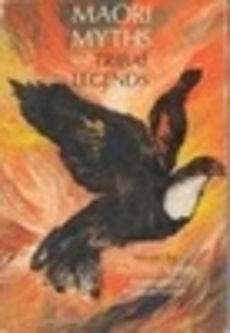 Māori legends of the “Patu-paiarehe” by James Cowen. The demi-god Māui chants a karakia (incantation) to entice his great fish to the surface. Carving of Māui capturing the sun. Māui was one of the great characters of Hawaiki, renowned for his daring. In this episode, the pint-sized Tamatoa sets off to rescue his talkative friend Moko the tuatara. A DNZ set of items relating to Māori myth and legend heroes. Taniwha were also believed to inhabit lakes, rivers and other freshwater areas. 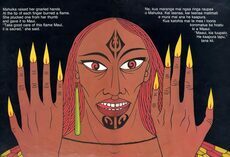 Hear the Matariki story of Ngāti Toa Rangatira iwi (tribe), retold for children by kaumātua (elder) Te Waari Carkeek. Māui’s legendary fishing up of the North Island gave rise to many place names. The story of the Little Mermaid is being retold in a new way at the Court Theatre these school holidays. 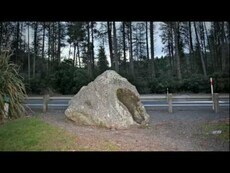 A distinctive rock by the side of State Highway 1 is significant to Māori for its role in the story of Hatupatu. 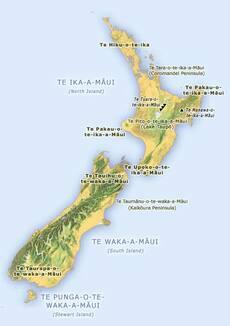 Peter Dowling on New Zealand place names and their links to Māori myths and legends. Newspaper article about the opera ‘Hinemoa’ performed in 1915. A sculpture of Hinemoa and Tutanekai in Rotorua. 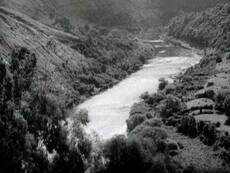 This documentary film tells the story of the Whanganui River. It recounts a Māori myth believing the river is the path carved by a god. 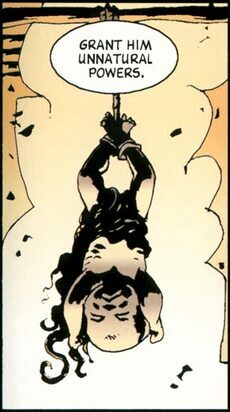 The demigod Māui is suspended over the smoke of a fire by his grandfather. 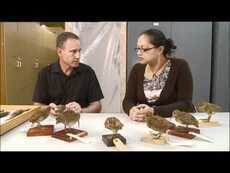 Discusses the Māori gods of pre-European times. 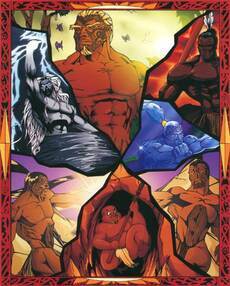 Traditionally, Māori divided the natural world into realms ruled by various gods. These gods, were the children of Ranginui (sky) and Papatūānuku (earth). This kūmara whakapapa (genealogy) shows how kūmara is descended from Rongo-māui and Pani-tinaku. Painting titled Mokoia Island from Ohinemutu by Charles Blomfield. A famous Māori legend from the animated series, A Māui te tipua - Māui, the enchanted. Bilingual lesson plan for the myth Te mahi hī a Māui - Māui’s fishing. Video about the five famous Māori gods. Poem about the legend Rona and the Moon. Legend behind the Auckland – Tāmaki Makaurau. Te Tau Ihu myths about events in the history of the South Island. A recent article celebrating te reo Māori and famous parakau or legends of the land. This link very briefly explains why myths and legends are important. 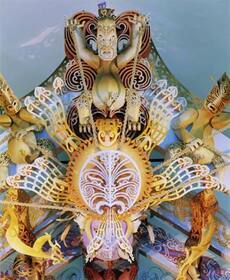 Tales from the mythologies of creation, including Maui and Aoraki. A gallery of items relating to Māori myths and legends. Four popular Māori Myths and Legends. Units and lesson plans for a drama on Māui. Marcus Winter is an indigenous artist of New Zealand, and is the only "performance painter" of his kind in Australasia and the Pacific. 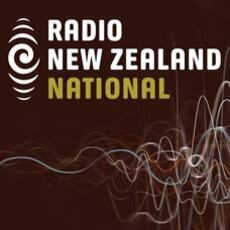 Song about the seven stars of Matariki. Legends of how the Gods made the Waka. Different myths and legends on the origin of pounamu. Anthology of Māori myths and legends. Education kit about Māori patterns and their links to myths and legends. Pdf with mythology lesson plans, flowcharts and worksheets. Many Answers has relevant links to Māori myths and legends. 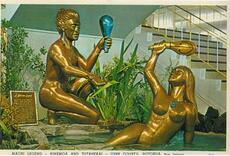 A photograph and information about a tiki carved from pounamu. 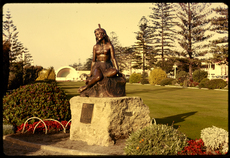 A photograph of the Pania Of The Reef statue in Napier, New Zealand. This picture illustrates the Māori myth of fishing up New Zealand (in other words, its discovery) by the Polynesian hero and demi-god Maui-tikitiki-o-Taranga. Part 1. Myths from Hawaiki The Sons of Sky and Earth Maui Tinirau Tawhaki Part 2. Traditions of the migration.